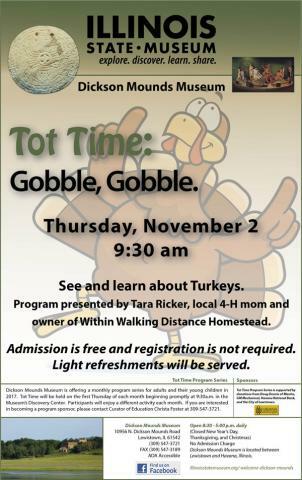 At Dickson Mounds Museum on Thursday, November 2nd at 9:30 a.m., the Tot Time program will be ‘Gobble, Gobble.’ Tara Ricker, local 4-H mom and owner of Within Walking Distance Homestead, will present a program featuring her family’s pet turkeys, and discuss the creatures’ bodies, diets, sounds, and temperament. Tots and their adults may enjoy related crafts to take home. Admission is free and registration is not required. Light refreshments will be served. Groups of eight or more should call the Dickson Mounds Museum in advance to ensure the availability of supplies. The program begins promptly at 9:30 a.m. with the program portion lasting approximately thirty minutes, followed by crafts, snacks, and time to explore the Museum. The 2017 Tot Time program series is sponsored by the City of Lewistown, Doug Dennis of Manito, Havana National Bank, and G-M Mechanical of Canton.